You can score 20 Free prints right now at Target. 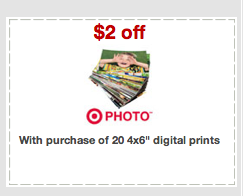 The 4×6 prints are on sale for $0.10, plus use the new $2 off Target Photo Printable Coupon or the $2 off Target Photo ShopKick App coupon to score them for Free. Make sure to check out the rest of the Target Coupon Match Ups for the week as well as the Flintstone Vitamin Deal at only $0.32 each.